Recent trends in voice technology – such as SIRI's natural language or voice biometrics – have many of our customers thinking that voice technology is a relatively new phenomenon. 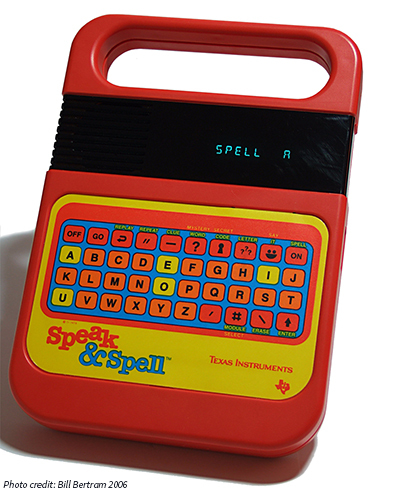 Those of us in the industry, however, know that voice tech has been around since the Speak and Spell. That doesn't mean we can't take advantage of speech technology's trendiness – the current spotlight on voice tech is a great opportunity for voice developers to start driving conversation around the advances made in speech technology since the interactive voice response of 20 years ago, and to challenge some of the existing prejudices against IVR technology. We hear often in this industry that interactive voice response is the "most hated technology"; ultimately, though, it is still the channel of last resort. Even though customers can interact with businesses using 9 different channels now, they pick up the phone when they can't find what they are looking for. Our job as IVR developers is to make that experience pleasant and positive, and one way to do this is to offer and encourage intelligent integration. So much information beyond a simple name and phone number is available through a business's customer database, and this information can be used to offer callers what they need up front, rather than forcing them to sit through familiar or unnecessary information. For example: if you are calling a pharmacy to renew a subscription, you don't want to have to navigate a complicated call flow to identify yourself and the medication you need. That information should be available in the CIS; the IVR should know who you are by your phone number, recognize that it's been a certain amount of time since your last renewal, and ask you if that is what you are calling about – then know what your dosage should be based on your history. All of this information is sitting in the database; with more communication between the IVR and the database, customers can be pleasantly surprised by the personalized call, and the effort taken to offer them the information they need right away. Intelligent integration can take this even further; if other channels of communication are consistently updating the database, the IVR system can use this information to help identify the problem the caller is having before the caller says a word. Most websites offer web help; if the customer has tried and failed to solve a problem on the website, the customer database should be updated with this information; then, when the customer calls the IVR, the system can look up the phone number, access the record of the customer's web activity, and ask the customer about the specific issue they are having – instead of simply offering unhelpful advice such as "Did you know you could do this on our website?" Interactive voice response technology has not been left behind in the constant push for technological advancement; the technology has gotten better and better, and if IVR developers can create IVR solutions that take advantage of the technology, the reputation of IVR solutions will get better and better too.